"Rock Hudson was the engagingly handsome star of Hollywood films of the 50s and 60s. He was the son of an auto mechanic and a telephone operator, who divorced when he was eight. Although he tried out for roles in school plays, he failed to win any because he could not remember lines. After graduating from high school, he worked as a mail carrier and was a Navy airplane mechanic during WW II. Returning to civilian life, he drove a truck, among other odd jobs, before breaking into films through the efforts of a persistent agent. He had never acted before, but his height and manly good looks made him a promising prospect. 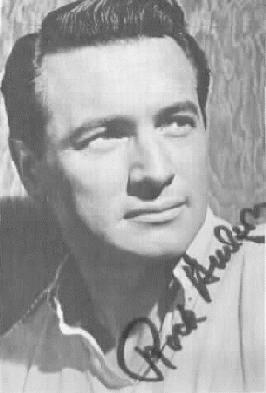 His name was changed from Roy Fitzgerald (he took his stepfather's name when his mother remarried) to the more vigorous-sounding Rock Hudson. His teeth were capped and he was coached intensively in acting, singing, dancing, fencing, and riding. He learned on the job. No less than 38 takes had to be filmed before he could successfully complete one line in his first picture, Fighter Squadron (1948). With time and practice he prevailed and by the mid-50s, after 'Magnificent Obsession', was among the leading stars on the Universal lot. In 1956 he was nominated for an Oscar for 'Giant' and in 1958 he won 'Look' magazine's award as Star of the Year. He was twice voted Hollywood's top box-office draw. In the 60s Hudson displayed a surprising gift for comedy, supplementing his repertory of tearful melodramas and adventure films with glossy bedroom farces, often opposite Doris Day. In the 70s he starred on TV in the popular light police series `McMillan and Wife' (1971---77). He started another series, `The Devlin Connection,' in 1981, but its production was suspended for a year while Hudson was recovering from quintuple-bypass heart surgery. In 1984---85 he played a recurring role in `Dynasty. 'Throughout his career, Hudson epitomized wholesome manliness. In 1955 he married Phyllis Gates, the secretary of his agent, Henry Wilson. The union lasted three years. His death at 59 of complications from AIDS astounded many of his fans, who were unaware of his homosexuality. His search for a cure focused worldwide attention on AIDS. He was the first major public figure to acknowledge openly that he was suffering from the disease. "